Heat oven to 375°F. In large bowl, combine all meatball ingredients; mix well. Shape into 1-inch meatballs. Place in ungreased 15x10x1-inch baking pan. Bake at 375°F. 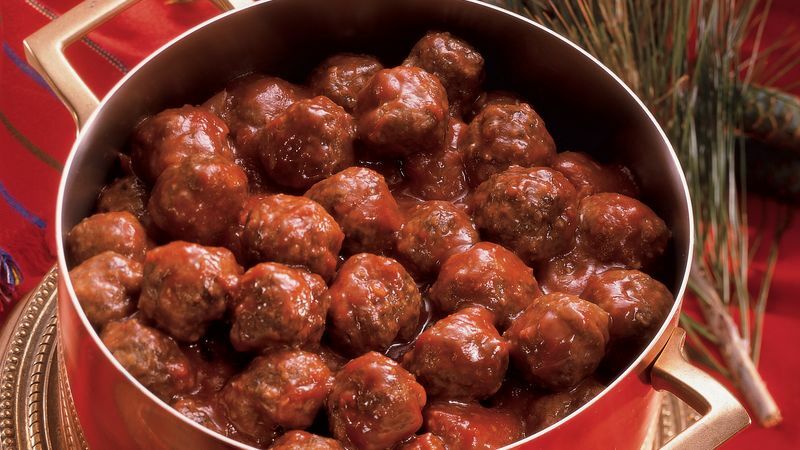 for 25 to 30 minutes or until meatballs are browned and thoroughly cooked in center. In large saucepan, combine all sauce ingredients; mix well. Cook over medium heat for about 5 minutes or until bubbly. Add meatballs to sauce; stir to coat. Cook over medium heat for about 5 minutes or until thoroughly heated, stirring occasionally.